Many of my friends have kids now. The experience transforms them--in their faces I see a centred look, replacing the effects of a million gnawing details that used to get to them. I wouldn’t call that ‘peace,’ exactly. I’d call it the weird calm that comes with a sense of purpose and the awareness of an absolute, incontestable good: the love of one’s child. I don’t have any kids myself, and neither did one of my favorite directors, Yasujiro Ozu. But he sure understood them. In his films they are wonderful and terrible, all at once, and always their parents’ imperative. They feel real. They remind me of children I know. Ozu is most famous for his weighty sound pictures of the 1940s and ’50s. However, he began directing in the silent era and as it happens, the silent era lasted a little longer in Japan than it did in the West. Many of these early films are also light comedies, which may surprise newer fans of his work. Tokyo Chorus, though typically Ozu-like in its examination of a family in crisis, is hardly emotionally gruelling, heavyweight art like Late Spring (1949), Tokyo Story (1953) or Floating Weeds (1959). Those films focus on the painful disconnect between parents and children, and in the first two cases, the pain is inevitable. But it must be said that a successful family spans the generation gap with good humour, too, and Tokyo Chorus, because it can laugh at itself, embodies this truth. Tokyo Chorus stars Tokihiko Okada as Shinji Okajima, a young accounts manager at an insurance company. Shinji is married to the patient, practical, Tsuma Sugako (Emiko Yagumo). They have three kids: a son of about seven, a daughter about a year younger, and a very chubby six-month-old. Everyone is happy and healthy, and Shinji’s son is eagerly awaiting a new bike, to be purchased with his father’s bonus. A more predictable film would've denied Shinji that bonus, generating conflicts from there. In this case, Shinji simply stands up for an elderly colleague and gets both of them fired. This is funnier than it sounds. Each man has an unhealthy obsession with his co-workers’ bonus envelopes—several sneak their envelopes into the urinal to open them, and are spied on even there. Shinji’s showdown with the boss is a glorified slap-fight with ceremonial fans. And by the way, if you’re bowing to someone as you leave his office, make sure he’s not closing the door at the same time. Shinji’s firing is the mid-way point between two brilliant comic sequences that, in their circularity, form the heart of Tokyo Chorus. Before he leaves for work, Shinji discovers his son trying to reach some records on top of a bureau by balancing, very unsafely, on a potty that is resting on the floor. Shinji scolds his son with a light swat, but that almost knocks the boy off the potty, so he has to catch him. The records fall and smash. Then Shinji leaves for work. When he returns, he gives his son a scooter, which is much cheaper than a bike. The boy is enraged. Shinji tries to scold him again, this time with a spanking. As the boy wails and struggles to get free, Ozu cuts to the baby, looking curiously at the potty on the floor. Shinji’s fate is clear: One day that baby will be on that potty; from there it will grow to the age of its brother and cause Shinji the same grief. Shinji’s victory is temporary at best. 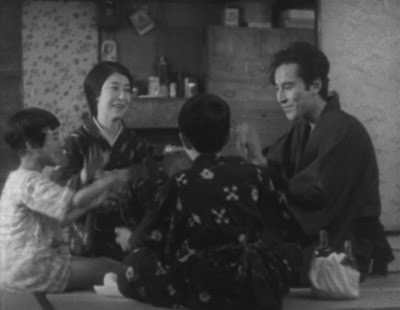 The family structure, Ozu tells us, is immutable, even though families are not. It will persist, repeating itself in a continuous loop that propels Shinji forward, preserving and finally dissolving his family unit, as it must. Ozu’s symbol for this is the bicycle. The bicycle’s wheels stay fixed in their frame, revolving forever, perhaps, but never going anywhere on their own. However, their turning is also the means by which the cyclist moves to a new place. No, I’m not over-thinking this: watch how many times bicycles show up during key moments in Tokyo Chorus, including an adult bicycle in a scene where Shinji must make a very difficult decision. Ozu’s calm touch and two excellent lead actors keep things above the level of farce, and carrying us confidently toward the finale. Okada and Yagumo play a convincing couple, never soft-pedalling Shinji’s loss of income simply for the sake of laughs. 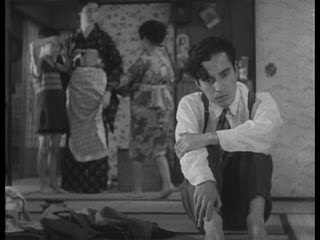 Yagumo grounds the film with her reserved and rather grave performance; Okada, meanwhile, balances his character’s natural positivity with the poisonous pride and rigidity that led him to get fired in the first place. His wife is stoic; but he is a swirl of emotions, all of them honest to the viewer. We believe that a man like this could have the troubles he does. And yet, we have faith in the strength of his family, and his love for his children, and believe that healing is possible. If the lessons of Tokyo Chorus are bittersweet, well then, so is life. 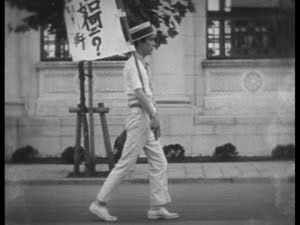 Silent Volume has also featured Yasujiro Ozu’s A Story of Floating Weeds (1934). **Tokihiko Okada’s work in this and other Japanese films should have led to a long career, but unfortunately, he succumbed to tuberculosis only three years after Tokyo Chorus was released. Criterion’s Silent Ozu—Three Family Comedies is a box set containing Tokyo Chorus, I Was Born, But... (1932), and Passing Fancy (1933). Being part of Criterion’s Eclipse series, these discs are light on extras. But hey, it’s Ozu... just watching them will impress your friends. The more you talk about Ozu, the more I want to watch these. Definitely adding to my list.